Out of 157 entries, the random number generator pulled comments numbered 122, 53, and 61. The Southern Fried Bride, 33mom, and Sarah W.
I have emailed two of the winners. 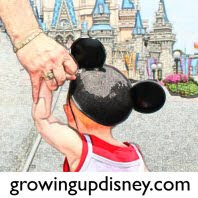 33mom, please email me your mailing address at growingupdisney@gmail.com within the next 48 hours. I can't find a way to reach you. UPDATE 05/04/11: 33mom, my apologies, but it's been 3 days and I must pull a new winner. Congratulations comment #77, Amy. I will email you momentarily. Thanks again to Travel with the Magic for sponsoring this giveaway and to everyone who entered. Travel with the Magic is an Authorized Disney Vacation Planner and would love to help you with your next Disney vacation. Whether you are going to Walt Disney World, Disneyland, or sailing on one of the beautiful ships of Disney Cruise Line, Travel with the Magic can take care of the details for you. And there is no fee to you! You'll pay the same or less than booking direct since Travel with the Magic knows the available deals and will watch for new ones for you. Even if you've already booked, Travel with the Magic can take over and be your expert. Contact Kelly and her team today!